Along an industrial strip on the city’s eastern edge, a block north of the Victory Temple and a drive-through Good Times Liquor, a halal slaughterhouse opened a meat market this summer. Inside, behind glass, beef shoulder sells for $3.99 a pound and boneless chicken is $1.69. There’s geese and a whole goat, skinned and gutted, still with its head, complete with eyeballs. Metal trays hold lamb brain. Musa Sumreen says most of his customers are Muslims who, for religious reasons, can’t eat meat from most stores. Others come because they just want to eat really fresh, or want to know exactly where their meat comes from. “Sometimes we do 1,000 chickens a day,” Sumreen said. “The Koran tells us to eat what is halal and wholesome,” he said. Musa Slaughterhouse is an important business for the area’s growing Muslim population, said Ahmesula. 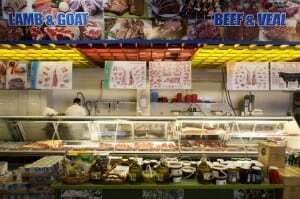 Without ensuring these steps were taken during the slaughter, meat is forbidden, or haram, to Muslims, he said. Far from shaved deli meat, it’s stark and real. He won’t kill her, he said. « Opinion: Halal Meat May Be Processed Differently, But Is it Safer?